Climb On! Bar: This one product can soothe burns, cuts, scrapes, rashes, cracked cuticles and heels, tissue nose, road rash, diaper rash, abrasions, poison ivy...any skin issue that needs deep moisturizing and nourishing. Climb On! Bar was originally formulated for rock climbers. It has crossed all barriers since it works on any skin type and any skin issue. The beeswax is the emulsifier which holds the ingredients together. It acts as a humectant, which draws moisture to the skin. It acts as a natural water resistant barrier to help skin stay protected. Anyone from babies to rock stars use this product. The essential oils of neroli and lavender work their therapeutic properties to help the body bring the skin back into balance. Our body sees Climb On! recipe as a friend not a foe! Creme: Our Crème is the best for the worst dry skin imaginable. Climb On! 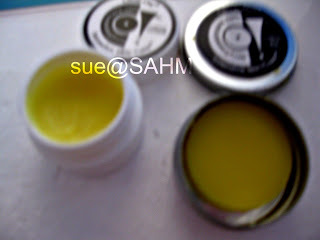 Creme is a deep moisturizer and acts like food for your skin in that it nourishes as well. Apply CO! Crème to your skin to moisturize and nourish if you are in the sun, wind, ice, rain, water, chemicals, etc. Use after extreme exposure for moisturizing relief. Along with the Climb On! Bar, the Creme can take the place of numerous items in your bathroom cabinet: make-up remover, cuticle cream, intense nighttime moisturizer, before and after the sun lotion, as a conditioning aftershave for face or legs. Climb On! Creme is a perfect moisturizing diaper rash cream, as a cradle cap lotion or any skin problem that is tender and needs easy application in order to moisturize. A little goes a long way! Now back to my dry skin. My hands get dry a lot. I've been dabbing some of the creme on my hands daily and it really is helping. As it says - a little really goes along way, you don't need much at one time. It goes on non-greasy and I like the scent of these products too. Just for the heck of it, because I read in the description about make-up remover, I tried it for that the other day, and it worked great! Another thing I noticed that is dry is my feet. Sorry if this is TMI, but my feet have been dry and even itchy lately. Especially my heels. I've been putting some of the Climb On! Bar on my heels every day. And I really see a big improvement! I would recommend these products to all my readers! Hi Susan - Glad you enjoyed! I use a combination of the Bar and Creme on my Eczema and it works wonders!